Colloidal systems are important across a range of industries, such as the food, pharmaceutical, agrochemical, cosmetics, polymer, paint and oil industries, and form the basis of a wide range of products (eg cosmetics & toiletries, processed foodstuffs and photographic film). A detailed understanding of their formation, control and application is required in those industries, yet many new graduate or postgraduate chemists or chemical engineers have little or no direct experience of colloids. 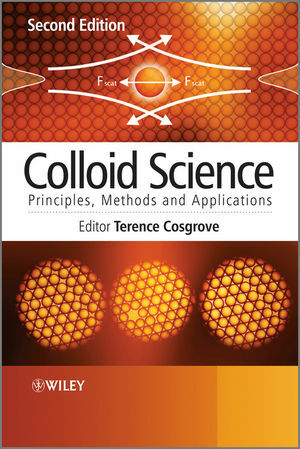 Based on lectures given at the highly successful Bristol Colloid Centre Spring School, Colloid Science: Principles, Methods and Applications provides a thorough introduction to colloid science for industrial chemists, technologists and engineers. Lectures are collated and presented in a coherent and logical text on practical colloid science. Terence Cosgrove is Professor of Physical Chemistry at the University of Bristol. Terence is a world expert in polymer chemistry and is fascinated by how polymers stick to surfaces. He is Director and Chief Scientific Officer of the Bristol University spin-out company, Revolymer. This is a polymer technology company which has patented a low adhesion chewing gum which can be removed easily from the streets. Terence developed the science behind removable chewing gum and the principle behind the technology can also be applied to many other markets and products. He is the author of over 150 papers and patents. 1 An Introduction to Colloids (Roy Hughes). 2 Charge in Colloidal Systems (David Fermin and Jason Riley). 2.2 The Origin of Surface Charge. 2.3 The Electrochemical Double Layer. 3 Stability of Charge-stabilised Colloids (John Eastman). 3.2 The Colloidal Pair Potential. 4 Surfactant Aggregation and Adsorption at Interfaces (Julian Eastoe). 4.2 Characteristic Features of Surfactants. 4.3 Classification and Applications of Surfactants. 4.4 Adsorption of Surfactants at Interfaces. 5.2 Microemulsions: Definition and History. 5.3 Theory of Formation and Stability. 7 Polymers and Polymer Solutions (Terence Cosgrove). 7.6 Theoretical Models of Polymer Structure. 7.7 Measuring Polymer Molecular Weight. 8 Polymers at Interfaces (Terence Cosgrove). 8.3 Models and Simulations for Terminally Attached Chains. 9 Effect of Polymers on Colloid Stability (Jeroen van Duijneveldt). 10 Wetting of Surfaces (Paul Reynolds). 10.7 Liquid Spreading and Spreading Coefficients. 10.9 Two Liquids on a Surface. 10.11 Spreading of a Liquid on a Liquid. 10.12 Characterisation of a Solid Surface. 10.13 Polar and Dispersive Components. 11 Aerosols (Nana-Owusua A. Kwamena and Jonathan P. Reid). 11.2 Generating and Sampling Aerosols. 11.3 Determining the Particle Concentration and Size. 11.5 The Equilibrium State of Aerosols. 11.6 The Kinetics of Aerosol Transformation. 12 Practical Rheology (Roy Hughes). 12.4 Examples of Soft Materials. 13 Scattering and Reflection Techniques (Robert Richardson). 13.2 The Principle of a Scattering Experiment. 13.3 Radiation for Scattering Experiments. 13.8 Small Angle Scattering Apparatus. 13.9 Scattering and Absorption by Atoms. 13.11 Small Angle Scattering from a Dispersion. 13.12 Form Factor for Spherical Particles. 13.13 Determining Particle Size from SANS and SAXS. 13.14 Guinier Plots to Determine Radius of Gyration. 13.15 Determination of Particle Shape. 13.17 Determination of Particle Size Distribution. 13.18 Alignment of Anisotropic Particles. 13.20 Contrast Variation Using SANS. 13.21 High Q Limit: Porod Law. 13.22 Introduction to X-Ray and Neutron Reflection. 13.24 A Simple Example of a Reflection Measurement. 14 Optical Manipulation (Paul Bartlett). 14.2 Manipulating Matter with Light. 14.3 Force Generation in Optical Tweezers. 15 Electron Microscopy (Sean Davis). 15.1 General Features of (Electron) Optical Imaging Systems. 16 Surface Forces (Wuge Briscoe). 16.2 Forces and Energy; Size and Shape. 16.3 Surface Force Measurement Techniques. 16.4 Different Types of Surface Forces. 16.5 Recent Examples of Surface Force Measurement.